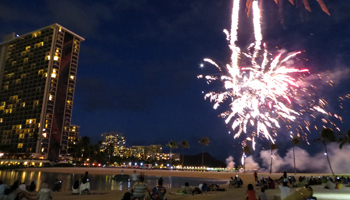 Free Waikiki Fireworks Show every Friday by the Hilton Lagoon. 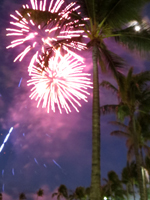 Waikiki Fireworks Light Up the Sky Every Week! 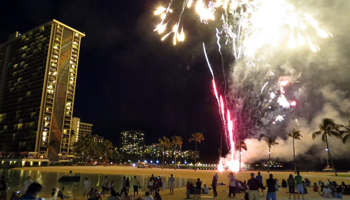 Every Friday evening at 7:45 you can watch a free Waikiki fireworks show put on by the Hilton Hawaiian Village at the Duke Kahanamoku Lagoon. The spectacle lasts approximately 10 minutes and is a dazzling way to end your week with a bang! Sorry, I couldn’t resist the pun. Maybe I’m just a big kid, but to me, fireworks on the beach in Hawaii just never gets old. And having a free weekly Hawaii activity that’s available for everybody… well, that’s one of the things that makes Hawaii a uniquely wonderful destination! As far as I’m concerned, the Hilton Hawaiian Village deserves all the free publicity I’m giving them in these pages simply because of the free Waikiki fireworks show and other free Waikiki entertainment I’ve enjoyed from them over the years! Going to the beach and then watching the Hilton Hawaiian Village fireworks is one of my family’s favorite things to do in Waikiki. 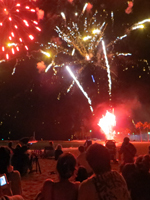 If you’re on Waikiki Beach want to watch fireworks from the lagoon, you’ll need to get there a few minutes early because they close the beach walkway during the show for safety reasons. My favorite viewing spot is from the western edge of the Hilton lagoon (see photo at top of this page). At this location, the fireworks literally explode overhead; the detonations echo off of all the surrounding buildings; and you really feel the full effect of being there! However, this might be too much for young children or military service members who suffer from post-traumatic stress disorder (PTSD). Another great viewing location is a little farther west on the edge of the Ala Wai channel at Magic Island (see photo in the footer of this page). You’re still close to the action, but the noise levels are greatly reduced. Plus you get added visual appeal from the Waikiki skyline, a marina, and that cool effect of fireworks reflecting off the water. Many local residents prefer this viewing location. Both of these locations are great in the summer because there’s enough twilight to see the silhouette of palm trees/sailboats in the foreground and Diamond Head in the background. The photos you take will WOW your friends! I suspect that the best possible Hilton fireworks view is from an oceanfront room in the Rainbow Tower of the Hilton Hawaiian Village, where the fireworks burst at eye-level a stone’s-throw from your balcony; but I don’t have any personal experience with that. The guests who stay in those rooms, though, will probably tell you it was worth every penny! Most guests, however, watch from the sands of Waikiki Beach directly in front of the Hilton Hawaiian Village. To me, this angle is not nearly as picturesque as its opposite on the shore of the lagoon. Nonetheless, you still get the up-close-and-personal experience – and they’re fireworks! For free! Every Friday! What’s not to like! ?